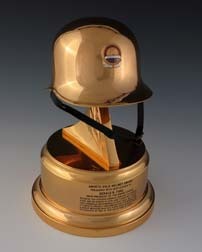 AMVETS Gold Helmet Award presented to Gerald R. Ford. Red, white, and blue insignia fixed to front of helmet that reads, "American Veterans / AMVETS / of World War II / Korean / Vietnam." Engraved plate on front reads, "AVMETS GOLD HELMET AWARD / Presented with deep esteem to GERALD R. FORD / 38th President of the United States / Because you steered America through its darkest / hour and on August 9, 1974, said, ‘I have not sought; this enormous responsibility, but I will not shirk / it’, AMVETS proudly recognizes our life member and / a son of Michigan who has given total dedication to / his country in time of war and in time of peace."